Two favorite panders of so-called fiscal conservatives are: 1) high corporate taxes make American companies less competitive in the world market; 2) high taxes on wealthy "job-creators" kills jobs. Panderbear pointed out previously that most economists consider those notions nonsense, and with good reason. Historically there is no correlation between federal tax rates and employment. Tax cuts for corporations went directly into huge bonuses and whopping salaries for corporate officers and into stockholder dividends, not into job creation. Wealthy individuals said thanks a lot and put the money in their pockets, not into hiring. Tax rates for individuals and corporations began dropping precipitously 30 years ago with President Reagan's tax cuts, plunged under President Bush II, and are now at historic lows. If cutting taxes on the rich creates jobs, how is it we have 9% unemployment while corporations sit on record amounts of cash? Nominal tax rates and effective tax rates are two different things. Many corporations do not pay anything close to the top corporate tax rate of 35%. Notoriously, General Electric in two consecutive years reported billions of dollars in profits and yet paid zero federal income tax. That's not 35%. That's 0.0%. Likewise, wealthy individuals seldom pay anything close to the 35% top marginal rate. First, many of the rich can turn most or all of their income into capital gains which are taxed at only 15%. That's why billionaire, Warren Buffet, paid an effective rate of just 17%. You may be paying a higher effective rate than that. Second, because there are no income limits on deductions, the rich and their accountants can find loopholes and tax dodges to reduce their tax bill even further. Buffett says we should stop coddling the rich. Panderbear thinks Mr. Buffett is a very wise man. The chart, from Tim Dickinson's November 9, 2011 Rolling Stone article, "How the GOP Became the Party of the Rich," gives some idea of the magnitude of potential tax revenues lost to tax breaks going mainly to corporations and high-income individuals. 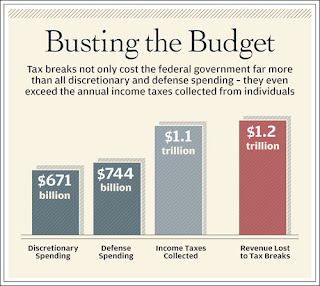 These subsidies of the monied-class are greater than all discretionary spending, even larger than the defense budget. 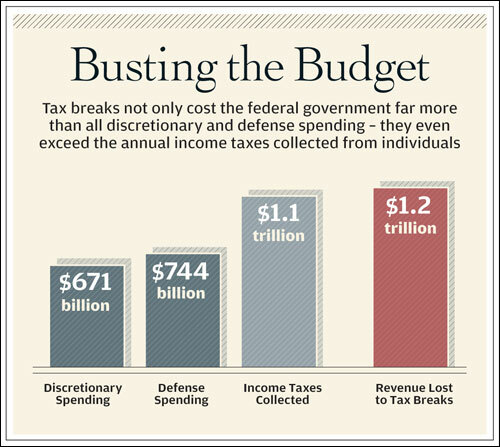 Eliminating those tax breaks would double the amount of income taxes collected, easily wiping out the deficit and creating huge surpluses. Panderbear thinks that lowering nominal tax rates while making them more fair and progressive and eliminating most loophole-creating deductions is a better, more transparent approach to sustainable fiscal policy.